Alligators up close & personal. GUARANTEED! 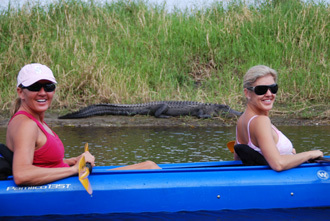 Myakka River Alligator Kayak Tour – COMING SOON! The Myakka River Alligator tour is entirely within the famous Myakka River State Park. The Park is a bird watcher’s paradise with nearly 100 species of birds. Wildlife is abundant with white tail deer, wild pigs, wild turkey, bobcats and otters commonly sighted. The main attraction is alligators. Alligators have been protected in this park for over 60 years. This means you will see many very large alligators. Our native Floridian guide will take you down river into a 140 ft. deep sinkhole, known as Deep Hole. At times, it is possible to view over 100 alligators in this sinkhole. You will see alligators up close and personal. GUARANTEED!! 4 hours (times vary by day see Book Your Tour) *Must arrive at least 15 min early for your tour.